We do our best to include tools in Mailchimp that will help protect you from scammers and spambots. Google reCAPTCHA is a challenge-response test intended to prevent spambots from adding fraudulent emails to your audience. In this article, you'll learn about different types of reCAPTCHA and how they're used in Mailchimp. Google reCAPTCHA is a system designed to tell humans and computers apart, so bots can't fill out forms maliciously on behalf of a human. The CAPTCHA acronym stands for Completely Automated Public Turing test to tell Computers and Humans Apart. Don't worry, you don't need to remember that! 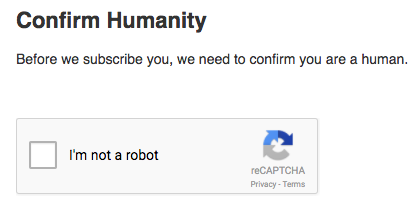 This type of reCAPTCHA requires new subscribers to check an "I'm not a robot" box. This type of reCAPTCHA does some additional analysis behind the scenes. It doesn't require new subscribers to check a box, and will only present a visible CAPTCHA if it detects it may be dealing with a bot. The type of form you're working determines which reCAPTCHA you'll use. ReCAPTCHA is only required for Mailchimp-hosted signup forms, but we recommend you enable it to protect your audience if you use embedded or pop-up up forms, or landing page signup form blocks. To enable reCAPTCHA for your audience's embedded, pop-up, and landing page signup forms, follow these steps. Click Audience name & defaults. Check the box next to Enable reCAPTCHA. All set! Now your audience's embedded and pop-up signup forms will display a checkbox reCAPTCHA, and your landing page signup forms will include an invisible reCAPTCHA. Mailchimp uses tools, like reCAPTCHA, to help keep spambots off your list. Learn how to spot fake email addresses, and how to remove them. To help you build a better audience, Mailchimp confirms that subscribers signed up to receive your emails. Learn the benefits of the opt-in process and how it works.